The Cottages at Thatched Farm Self-cateringThatched Farm is a charming pink washed Grade II Listed property surrounded by open countryside between Waldringfield & Woodbridge. Daffodil Cottage - Sleeps 3/4: A onetime old farm building now sympathetically renovated whilst retaining its original character & charm. Ground floor with newly fitted kitchen includes fridge, electric oven, hob & microwave. Open plan living/dining area with comfortable seating, TV, DVD. Separate newly fitted shower room. Up the winding oak staircase is a very pretty galleried mezzanine double bedroom. Separate steep staircase to the single mezzanine bedroom (the stairs are not suitable for children under 7 or anyone with mobility difficulties). A sofa bed is also available in the living area. Bluebell Studio - Sleeps 2, ground floor. The newly fitted kitchen with fridge, electric oven, hob, microwave & breakfast bar opens into the studio double sleeping/living area with French windows onto the gardens. On site laundry facilities available for both cottages in the separate laundry room with washing machine, tumble dryer, iron & ironing board. Each cottage has its own garden table/chairs & guests are free to use & enjoy the gardens. Heating, linen, towels & tea towels are provided. Ample parking & secure cycle storage available. Sorry, no smoking in the cottages. Children welcome. Both cottages booked together would be ideal for a party of 5/6. Free wireless internet access. 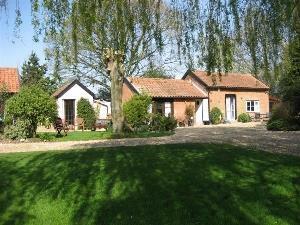 The Cottages at Thatched Farm offers weekly bookings starting on Friday and sometimes short breaks. 1 bed/sitting room with double bed. Bluebell Studio offers weekly bookings starting on Friday and sometimes short breaks. Situated 5 minutes from the A12. Situated 20 minutes from Ipswich Railway Station. Wonderful stay at a very nice spot.